Standard interior features for 2009 Saturn VUE entry-level XE trim include front cloth bucket seats with driver lumbar support, air conditioning, cruise control, remote keyless entry, and power windows and door locks. The AM/FM audio system comes with a CD player, an MP3 input jack, and three months of XM satellite radio. In addition, steering-wheel-mounted audio controls come standard. Available features include a power tilt/sliding sunroof, heated front seats, a CD changer, and Bluetooth wireless technology. Standard safety features include dual-stage front airbags, seat-mounted side-impact airbags, and roof-mounted head side-curtain airbags. A one-year subscription to OnStar with emergency services, vehicle diagnostic, remote door unlock, and roadside assistance also comes standard. Exterior features include daytime running lights and power exterior mirrors. A 169-hp, 2.4-liter Ecotec four-cylinder gas engine provides power for the front-wheel-drive XE trim. The engine produces 161 lb-ft of torque and links to a four-speed automatic transmission with overdrive. The Saturn XE has a 19-gallon fuel tank and posts fuel economy numbers of 19/26 mpg. Standard performance-related features include the StabiliTrak electronic stability control system, a traction control system, and four-wheel antilock brakes. The Saturn VUE XE rides on 16-inch aluminum alloy wheels with all-season tires. The 2009 Saturn VUE V6 XR combines a peppy 257-hp, 3.6-liter V6 engine with a wide range of standard features, including Bluetooth wireless connectivity, a power-adjustable driver's seat, and an electrochromic, automatic-dimming rearview mirror. Other standard interior features for the VUE V6 XR include front bucket seats with lumbar support for the driver, air conditioning, cruise control, power windows and door locks, OnStar, and an AM/FM audio system with a CD player, MP3 input jack, and three months of XM satellite radio. A full range of airbags, including dual-stage front airbags, seat-mounted side-impact airbags, and roof-mounted head side-curtain airbags, also come standard. Optional features include heated front seats, leather upholstery, a navigation system, and a power sunroof. The V6 engine generates 248 lb-ft of torque and links to a six-speed automatic transmission with overdrive. Fuel economy numbers for the front-wheel-drive VUE V6 XR check in at 17/24 mpg. Other performance-related features include four-wheel antilock brakes, traction control, and GM's StabiliTrak electronic stability control system. The VUE V6 XR rides on 17-inch alloy wheels with all-season tires. Standard exterior features include front foglights, heated power exterior mirrors, automatic headlights, and daytime running lights. The 2009 Saturn VUE AWD V6 XE comes equipped with a 222-hp, 3.6-liter V6 engine, which carries over from the previous year. The engine produces 219 lb-ft of torque and links to a six-speed automatic transmission with overdrive. Fuel economy numbers for the V6 engine check in at 16/23 mpg. All-wheel drive comes standard, along with four-wheel antilock brakes, traction control, and GM's StabiliTrak electronic stability control system. The VUE AWD V6 XE rides on 16-inch wheels with all-season tires. Exterior features include automatic headlights, daytime running lights, and power exterior mirrors. Inside, the VUE AWD V6 XE comes equipped with such features as front bucket seats with driver lumbar support, cruise control, air conditioning, remote keyless entry, and power windows and door locks. An AM/FM audio system includes a CD player, an MP3 input jack, and three months of XM satellite radio. Steering-wheel-mounted audio controls also come standard. Owners can add such options as a power sunroof, heated front seats, a CD changer, and Bluetooth wireless technology. Dual-stage front airbags, seat-mounted side-impact airbags, and roof-mounted head side-curtain airbags are among the standard safety features. A one-year subscription to OnStar also comes standard. Called a "mild hybrid" by Saturn, as opposed to the automaker's two-mode "full" Hybrid V6, the base VUE Hybrid runs on a 2.4-liter, inline four-cylinder Ecotec engine assisted by an electric motor during acceleration. The electric motor also restarts the gas engine when it shuts down at stops to conserve fuel. The engine produces 172 hp and 167 lb-ft of torque, and links to a Hydra-Matic four-speed automatic transmission. The four-cylinder VUE Hybrid posts respectable fuel economy numbers of 25/32 mpg, and includes such standard features as four-wheel antilock brakes, traction control, and the StabiliTrak electronic stability control system. The front-wheel-drive VUE Hybrid rides on 17-inch alloy wheels with low-resistance tires, which help reduce friction and improve fuel efficiency. Exterior enhancements designed to improve aerodynamics and conserve fuel include a lowered stance, which reduces drag, and an integrated rear spoiler. Other exterior features include automatic headlights, daytime running lights, and power outside mirrors. Inside, the Saturn VUE Hybrid comes equipped with such standard features as front bucket seats, cruise control, air conditioning, and an AM/FM audio system with a CD player, MP3 input jack, and three months of XM satellite radio. Standard safety features include dual-stage front airbags, seat-mounted side-impact airbags, and roof-mounted head side-curtain airbags. Optional features include heated front seats, leather upholstery, a CD changer, and a power sunroof. As its name implies, the 2009 Saturn VUE AWD V6 XR adds an all-wheel-drive system to its standard feature list, which also includes GM's StabiliTrak electronic stability control system, traction control, and four-wheel antilock brakes. Outside, front foglights, daytime running lights, and heated power exterior mirrors all come standard. The Saturn VUE AWD V6 XR rides on an independent strut front suspension, a three-link rear suspension, and 17-inch alloy wheels with all-season tires. For power, the VUE AWD V6 XR retains the previous-year's 257-hp, 3.6-liter V6 engine, which produces 248 lb-ft of torque and links to a six-speed automatic transmission with overdrive. Inside, standard features include Bluetooth wireless connectivity, a power-adjustable driver's seat, and an electrochromic, automatic-dimming rearview mirror. Front bucket seats with driver lumbar support, air conditioning, cruise control, OnStar, and power windows and door locks also come standard. The AM/FM audio system includes a CD player, an MP3 input jack, and three months of XM satellite radio. A full range of airbags, including seat-mounted side-impact airbags and roof-mounted head side-curtain airbags, are among the SUV's standard safety features. 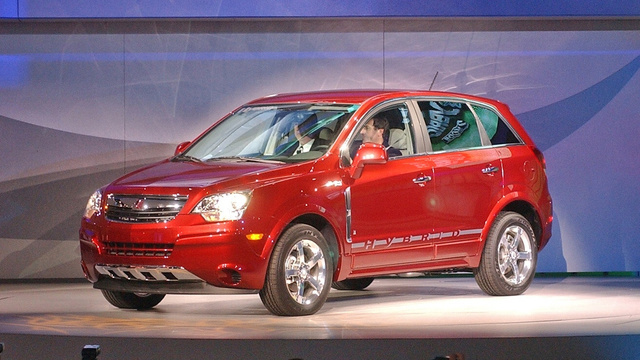 The sport-oriented 2009 Saturn VUE V6 Red Line comes equipped with a number of features not available on other VUE trims, including a sport-tuned suspension and a six-speed TAPshift automatic transmission, which enables drivers to manually shift gears using paddle shifters mounted on the steering wheel. The transmission links to a 3.6-liter, dual-overhead-cam V6 engine with variable valve timing, which generates 257 hp and 248 lb-ft of torque. The VUE V6 Red Line also comes equipped with a revised front end with a bolder look, including a larger lower air intake opening. The rear end includes an integrated spoiler and chrome exhaust tips. Front foglights, automatic headlights, heated exterior mirrors, and 18-inch wheels with performance tires are among the VUE V6 Red Line's other exterior features, while performance-related features include antilock brakes, traction control, and the StabiliTrak electronic stability control system. Inside, standard features include heated front bucket seats equipped with ebony bolsters, a leather-wrapped steering wheel, Bluetooth wireless technology, air conditioning, cruise control, and a six-speaker AM/FM audio system with a CD player, MP3 input jack, and three months of XM satellite radio. Remote keyless entry and power windows and door locks also come standard. Dual-stage front airbags, seat-mounted side-impact airbags, and roof-mounted head side-curtain airbags are among the standard safety features. The 2009 Saturn VUE AWD V6 Red Line adds an all-wheel-drive system to its long list of sport- and performance-oriented features, which include traction control, antilock brakes, and the StabiliTrak electronic stability control system. For power, the VUE AWD V6 Red Line comes equipped with a 3.6-liter, dual-overhead-cam V6 engine, which generates 257 hp and 248 lb-ft of torque. The V6 Red Line features a bold front end, with a large lower air intake opening and front foglights, while an integrated spoiler and chrome exhaust tips dress up the rear end. Other standard exterior features for the AWD V6 Red Line include automatic headlights, heated exterior mirrors, and 18-inch wheels with performance tires. Standard interior features include heated front bucket seats with bolsters, a leather-wrapped steering wheel, Bluetooth wireless technology, air conditioning, cruise control, and a six-speaker AM/FM audio system with a CD player, MP3 input jack, and three months of XM satellite radio. Other standard interior features include remote keyless entry, OnStar, and power windows and door locks. Standard safety features include dual-stage front airbags, seat-mounted side-impact airbags, and roof-mounted head side-curtain airbags. Available in limited numbers for 2009, the Saturn VUE Hybrid V6 combines two 55-kilowatt electric motors with a 3.6-liter gas-powered V6 engine. The powerplant operates in two modes. In the first mode, which drives the SUV at speeds under 40 mph, the two-mode CVT (continuously variable transmission) shifts power between one of the electric motors, the gas engine, or both the gas engine and an electric motor, while the other electric motor recharges a 300-volt array of 22 nickel-metal hydride batteries, located under the cargo floor. In Mode 2, which takes over at higher speeds, the V6 gas engine provides the primary power, assisted by the electric motors when additional power is required, such as when towing a trailer, passing, or climbing steep hills. The gas engine shuts down when the SUV decelerates or idles, and the electric motors alone provide the power to drive the SUV in reverse mode. With its hybrid engine, the compact SUV achieves fuel economy numbers of 25/32 city/highway mpg. As with the other VUE SUVs, antilock brakes, traction control, and the StabiliTrak electronic stability control system all come standard. The VUE Hybrid V6 rides on lightweight 17-inch wheels with low-resistance tires. Like the base VUE Hybrid, the VUE Hybrid V6 has exterior enhancements designed to improve aerodynamics and fuel efficiency, including a lowered stance, which reduces drag, and a rear spoiler, which helps improve airflow. Other exterior features include power-adjustable heated outside mirrors, chrome door handles, and chrome dual exhaust tips. Inside, the Hybrid V6 comes with a hybrid-oriented instrument panel, including an efficiency gauge (replacing the tachometer), which displays the current engine operating mode and informs drivers when they're achieving maximum fuel efficiency. Other standard interior features include a leather-wrapped multifunction steering wheel, air conditioning, cruise control, and a six-speaker AM/FM stereo with a CD player, MP3 input jack, and three months of XM satellite radio. Options include a navigation system and a power sunroof. Six airbags come standard, including seat-mounted side-impact airbags and roof-mounted head side-curtain airbags.